There’s nothing like touring gardens to inspire the inner-landscaper in each of us. Not too long ago I visited a welcoming garden developed by a creative and well-known San Diego potter named Liz. Her garden stands alone as a beautiful small oasis but with the addition of her pottery, the garden thrives as an adventure in discovery. 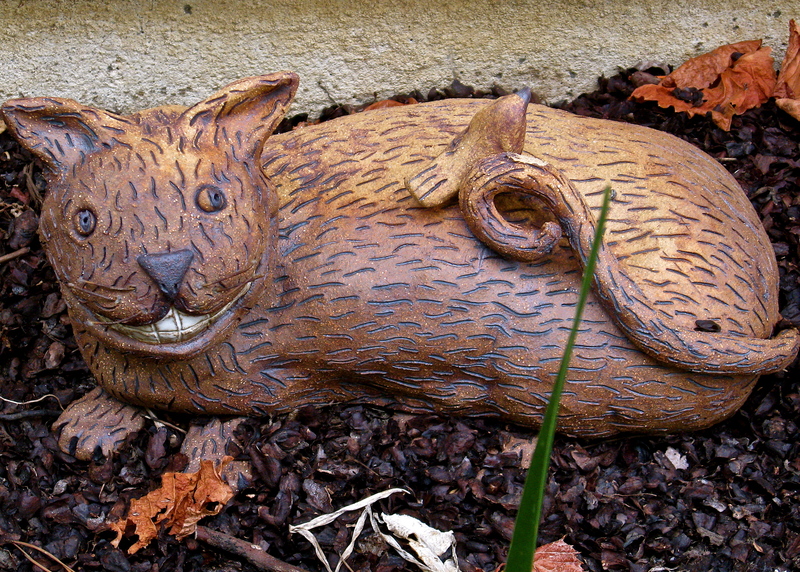 The artist has maximized every square foot of her garden with whimsy and delight. Beneath a low limb, tucked next to a tiny bench, and at the end of every path is a discovery to bring a smile. Liz’s art and her gardening design is inspired by her love of nature in all forms: insects, humans, bunnies, chicks, birds, cats and dogs. With a studio in her home, what began as a hobby has developed into a pottery passion for this artist who has a sizable following in the San Diego area. Liz’s art is both functional and fun whether made for the garden or for inside the home and she is ever exploring and evolving with her craft to the delight of those who follow her. 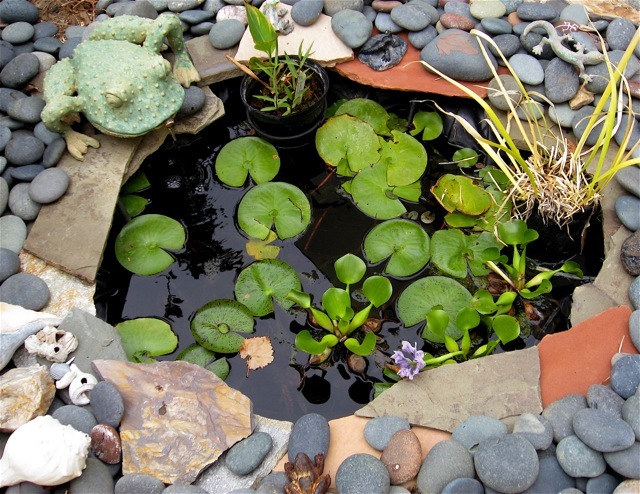 Instead of an expansive pond, she has created a tiny structure surrounded by river rocks and her spouting frog to give the sound of water in the garden. Each one of her animal creations hidden in her garden tell a tale, whether it’s the cat waiting for a bird to wander too close or the flock of birds ready to take flight. Each has a personality and a life of its own. Liz has also built mystical totems to watch over her garden, inviting visitors to contemplate the meaning behind the individual pieces stacked atop each other. Art in the garden can add a rich dimension and can be a delight for visitors to chance upon in the landscape. Liz’s whimsical vision of the flora and fauna world would not work in every garden but her sanctum is a magical and vibrant marriage of art and garden. Her artistic style is free-flowing and enchanting. I think she is truly inspirational, however I might be just a tad bit prejudiced…. you see, Liz is my amazing little sister! 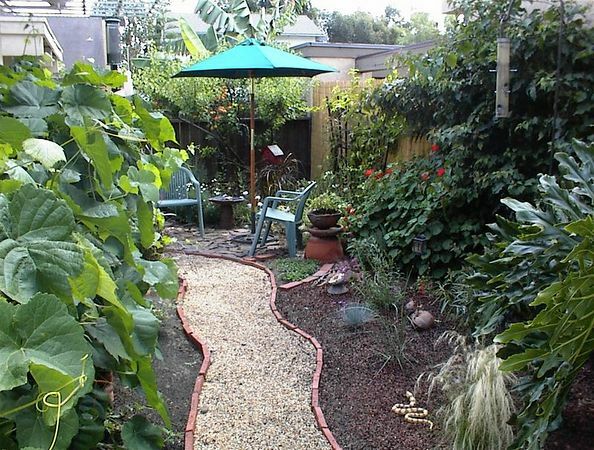 This entry was posted in Horticulture, San Diego by Annie. Bookmark the permalink. I like the birds a lot. I just took a ceramics class so maybe I’ll try to make some. My, my, my… there must be more hours in your day than my day. Your blog takes me on your wonderful journeys but did not know about ceramics. 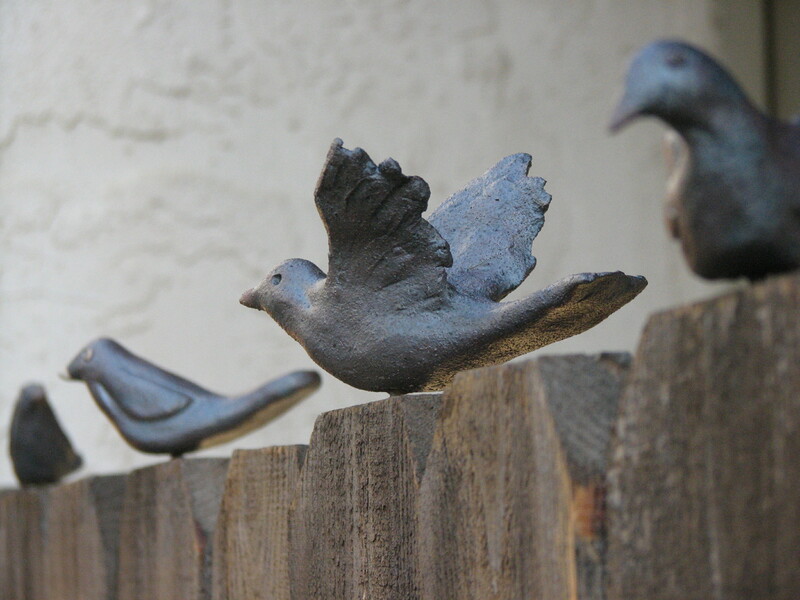 Liz’s birds are fashioned with a screw so that they are easily mounted in wood. Each bird is different. I have a small ‘flock’ of her birds that I adore. Love all her whimsical art! Her garden is a museum. But it’s way more personal than a museum. I would categorize it more as a nature preserve. Ann, what a talented family you have. Thanks for sharing your gifts with us. Great article, Ann! I visited this garden a few weeks ago and you’re so right about how personal and magical it is. Coming from you, Susi, that is a true compliment. I have watched you on HGTV! How creative! I’ve heard how delightful this yard is and I hope to visit it very soon. I love everything I see in the photos. I know I won’t be disappointed! Holly, Explore Liz’s garden at first light with your morning coffee from my favorite spot under the umbrella by the pond . Ahhhhh…..